For a long time, the château was at the heart of the political and economic life of the viscounty of Trièves. Built in 1590 by the Clermont-Tonnerre family, it was acquired by the Bardoneche family in 1679 and modified in the 18th century. 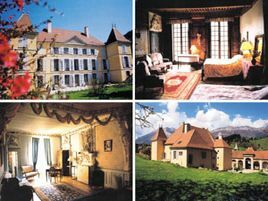 The rooms, which are reached by a lovely stone staircase with a remarkable wrought-iron banister, are comfortable and elegantly decorated with wood-panelling, paintings, sculpted chimneybreasts and french-stle ceilings dating from the 16th and 17th century. Hearty breakfasts with homemade jams and brioches. Regional dishes and produce served in one of the lounges, around the hearth. Friendly welcome. An excellent address!. 3 suites and 2 rooms with bath or shower and WC. From 51 to 63 euros (1 pers. ), 57 to 69 euros (2 pers. ), 77 to 89 euros (3 pers. ), 97 to 109 euros (4 pers.). Baby equipment, games, children's meals. Spacious family suites. Large grounds. The closest station is Monestier, located at 0 km. The closest airport is Grenoble Isère, to 60 km.